At Redbricks, we believe that the school is an important part of the community. The school thrives because of the community, and for the benefit of the community. Hence, we conduct events wherein children can learn through multiple interactions with the community and the community also benefits through the efforts of & interactions with our children and staff. The different stakeholders in the school community include; the children of different classes, teachers, parents & children's families, and non-academic staff members. While the external stakeholders beyond the school community include; children & educators of other schools, parents & families of other children, governmental and non-governmental organizations, corporations, and so on. The various celebrations and events at the school are designed to foster connections amongst the school community members and also with the external community members towards the larger interest of national development through good education. Redbricks Children hold regular open exhibitions of their project work & perspectives done in the school for the children of other classes, parents & their families. As a school, we also hold one major exhibition of children's work every year, open to the external community at a public place like an art gallery, a community center, etc. The purpose of such community exhibitions is to share children's thoughts, skills & work with the larger community in order to inspire them and spread certain messages. In 2013, Class 5 & Class 6 children of Redbricks learnt Photography with an expert for 4 months. 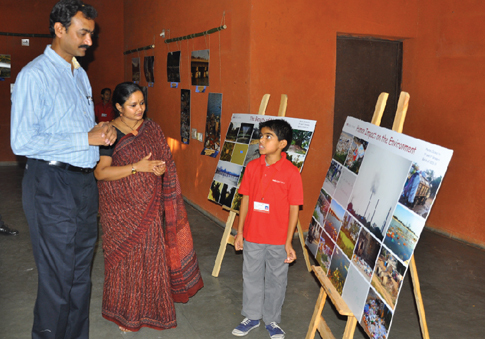 At the end of the module, children hosted a Photography Exhibition on the theme of "Environmental Sustainability" at the Centre for Environment Education (CEE), Ahmedabad. Through this exhibition, the children applied their photography skills and gained a lot of confidence. The visitors were made aware about the state of the city's environment through the medium of photographs and inspired to take action. This is an annual whole-school event celebrating the power of sports, health and fitness, where each child of the school participates. Until Class 4, all children receive Certificates and Medals of Participation. From Class 5 onwards, all children continue to receive an acknowledgement for participation but the winners also receive special medals and trophies. We believe that every form of participation should be acknowledged and structured individual competition should be avoided in the early years. As children grow older, they learn to handle competition better emotionally without hampering their self-confidence and motivation to perform/participate. Kathotsava (Ahmedabad) is an annual community initiative started by Redbricks Foundation & Kathalaya, Bangalore since 2012, to celebrate the power of stories and to promote storytelling as an educational tool. It is also an event to spread cultural awareness and to revive the rich heritage of our folk stories and storytelling traditions. The story festival is held over three days every year during which a variety of storytelling performances by experts, children's workshops and adult workshops are hosted. Ms. Geeta Ramanujam, Founder director of Kathalaya and an international storyteller is the master facilitator and trainer in the event. Redbricks also conducts a three-day intensive certificate course in Storytelling for Adults with Geeta Ramanujam as the faculty. For more information, visit www.kathalaya.org or contact our office. We celebrate our Foundation day every year in March with a Kids' Mela event. This is a platform for children and parents where fun and frolic come together with education and learning. It is based on the principles of Dr. Howard Gardner's 'Theory of Multiple Intelligences'. In this event each corner/stall stands for a particular intelligence, namely Linguistic, Logical, Visual-Spatial, Bodily- Kinesthetic, Interpersonal, Intrapersonal, Naturalistic and Musical. The activities are designed in a manner that evoke & surround these Intelligences. The staff, children & parent volunteers of Redbricks School design and conduct all the activities. 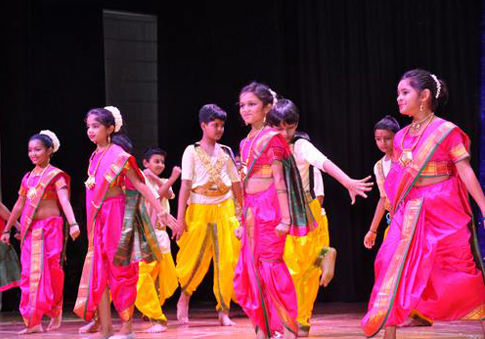 Apart from the major events, Redbricks children engage in a variety of celebrations throughout the year that help them build cultural & social values, while instilling a sense of togetherness.